Two mirrors...two stories. Im not sure which one I got first, but I got them...dats all dat mattas. The first mirror was picked up on my way home from work. I was not going to go to this Goodwill. Let me digress for a moment. Normally in the course of one day I can visit two Goodwill stores. One in the city I am working and the other thats in my city when I return from work. Either way I normally stop by at least one a day. Ok...back on track. Well I left work and thought...nah I wont stop by Goodwill. Someone my car switched to auto drive and...POOOF! I found myself in Goodwill and saw this gem. The insets on this morrior actually had mirrrors. I guess because they were missing the entire piece was thought to be no good and found its way into Goodwill. The mirror is 45 inches tall and 25 inches wide. The vintage tag on the back says "Turner Wall Accessory." I did research the compamy. It couldve but a million dollar mirror...key word...couldve been. The connected circles/dots you see here are actually raised and add so much more texture. Cant wait to actually use it in a space. Well I saw the mirror picked it up and a lady said, "I tink dats too much for that mivoo. Look heraaa da mivoos r commin off it." I replied, "Yea your right, but I have a creative mind and I can make it look great." As I allowed her in on my little master minded plan for the piece her eyes began to widen. In the back of her mind she was probably kicking herself. O yea. 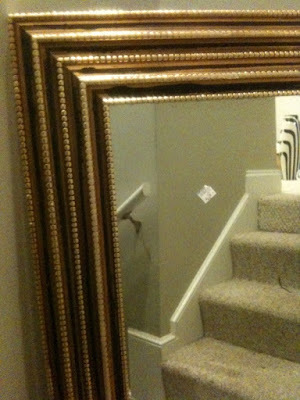 The mirror was $19.99. Theres no tax in our local Goodwill stores. 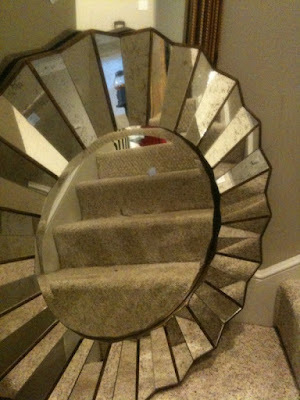 The story for this popular sunburst mirror is that when I saw it, I may have knocked this old woman over. O no, I dont feel bad...the old women in Goodwill are quite roasty and fiesty. If you try to be kind and sweet to them...they will end up taking the item you are eyeing...and wont even say thank you. Joking about the knocking the old lady out the way...I think. 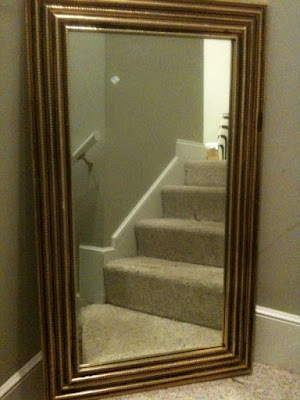 Well legend has it the mirror came in the night before and there was a lady who wanted it but didnt have the money. Sooo sad...for her that is. Well as I paraded around Goodwill with my latest treasure I became the hottest commodity among bargain shoppers. Doesnt it feel good to know you have what everyone else may want but they cant get it. Its boastful...yes I know...but feels darn tootin good!!! P.S. I had to take the pictures with my iphone because my computer and camers didnt want to get on one accord today.